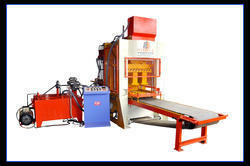 We manufacture Hybrick 600 machine which has been recognized for its cost-effectiveness and high production capacity. It has been fabricated from superior quality raw material and designed to deliver optimum performance. Offered at economical prices, our Hybrick 600 machine is convenient to use and durable. We are flawlessly engaged in meeting the demands of precision designed fly ash machine that are used for making bricks of different sizes using fly ash. These are widely used in construction industry and can also be customized as per the specifications given by the clients.